LED headlight KL 100, 2x AA, 1-LED, plastic, 100lm, IP44, waterproof, LuxPremium, Brennenstuhl, 1178760 Moisture-proof (IP44) and compact LED head torch LuxPremium from Brennenstuhl with 1x extra bright Toshiba-LED for powerful light, 3x working modes, 2x AA batteries, high luminous flux 100lm and working range 40m. Focus angle can be adjusted. Suitable for professional use and hobby activities. LED headlight KL 200F,b3xbAA, 1x LED, plastic, 200lm, IP44, waterproof, LuxPremium, Brennenstuhl, 1178780 Compact LED head torch from LuxPremium series from German brand Brennenstuhl with 1 powerful CREE-LED, 4 working modes, high luminous flux 200 lm and working range 100 m. Suitable for professional use and hobby activities. 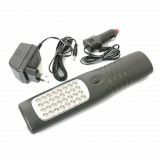 LED Hand-held emergency lamp with dynamo, rechargeable, HL DA 6 DM2H, Brennenstuhl, 1178590 Emergency LED hand working lamp with 6x SMD diodes and dynamo from Brennenstuhl with robust rubber clad housing. It offers light anytime even w/o a carged battery. Integrated Li-Ion battery. 360° adjustable hook and magnet. Energy saving mode. Inclusive 12V charger for car cigarette lighter. LED Universal Work Lamp, 4 + 3 LEDs, 200lm, 6500K, cool white, HL DB43 MH, Brennenstuhl, 1175420010 Small size LED work light and torch with handle/magnet with 4x front LEDs + 3x CREE LEDs for universal use. Luminous flux 200lm+20lm and cool white lighting 6500K. Powered by 3x AAA batteries (included) for 6h continuous use. ON/OFF switch. Bright light in a pocket size suitable for hobby activities, camping and repairs. LED Outdoor Camping Light OLI 0200, Brennenstuhl, 180lm, 4000K, natural white, IP44, waterproof, 1171550 Highly versatile LED Outdoor Lamp OLI 0200 from Brennenstuhl with 12 LEDs, 180lm flux and natural white lighting (daylight) 4000K. Suitable for use at home, at the garden, when camping and for outdoor activities. Mobile LED Light DINORA 3000, Brennenstuhl, 24W, IP65, 220VAC, 1171570 The pleasant looking, glare-free work floodlight DINORA 3000 from Brennenstuhl has special light scattering for extensive illumination and light but still very robust design. LED metal flashlight 9 led The LED torch is compact, comfortable and yet powerful with 9 LEDs. Works with 3 x AAA batteries. Color - black, green, blue, red. LED flashlight, rechargeable, Braytron, 1W, 6500K, cool white, BC03-00130 Compact LED torch from Braytron (BC03-00130) which is rechargeable and offer bright cool white light. Very suitable for mountain walks, repairs and other activities in dry conditions. LED headlamp, rechargeable, YJ-1898, 13LEDs, 100lm Super bright and durable LED rechargeable headlamp YJ-1898 with 13 LED diodes and two modes of lighting (economical - 9 LEDs and normal - 13 LEDs). Luminious flux 100lm. Small, light and easy to use LED head floodlight for repairs where you need free hands. Made in China. LED flashlight, rechargeable, metal housing, Li-ion battery (8800mAh) Metal rechargeable LED torch light, moisture and dust-proof, with adjustable focus. It can be charged from a car, truck and the power grid. LED flashlight Brennenstuhl, Lux Premium, TL 250F, 160m, 250lm, 1178600161 Extremely compact and powerful Focus LED torch light (LuxPremium) from german brand Brennenstuhl with durable metal housing and wrist strap. With extra bright 250lm CREE-LED for powerful light. Protection degree against water and dust IP44. Suitable for outdoor use. LED headlamp, 1LED, CREE, 3xAAA, focus of the light, 160lm Small and practical LED headlamp with option to focus the light. Luminous flux 160lm. Long LEDs life up to 100 000h. List Price 7.80лв. VAT Incl. 7.41лв. VAT Incl. 7.02лв. VAT Incl. LED flashlight, rechargeable, Brennenstuhl, Lux Premium, TL 350AFS, 200m, 350lm, 1178600200 Extremely compact and rechargeable LED focus torch from Brennenstuhl with high quality alluminium housing, with a lithium ion battery type 18650 included in set and two chargers included (for the mains and the car cigarette lighter). With extra bright CREE-LED for powerful light output of 350lm. LED portable and rechargeable lamp, 12 VAC, car lighter socket LED portable rechargeable lamp, 12 VDC with car lighter or 110 - 240 VAC adapter. There is a hook that can be attached anywhere and a magnet for fixing to metal surfaces. List Price 27.90лв. VAT Incl. 26.50лв. VAT Incl. 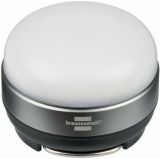 Portable handlamp with rubber cable, Brennenstuhl, E27, 60W, 5m, 220VAC, 1176460 Portable rubber handlamp with 5m cable lenght from german brand Brennenstuhl. Robust, handy, inspection lamp with comfortable handle and protective glass cover. Wire basket with caps. Compatible with bulbs of energy class A++/Е. Made in Germany. LED flashlight, rechargeable, EMOS, KB-2137, 18LEDs, IP43, waterproof, dark grey Hand LED rechargeable flashlight from EMOS, model KB 2137 made of plastic with two lighting modes- economy (6 LEDs) and normal (18 LEDs). List Price 44.00лв. VAT Incl. 41.80лв. VAT Incl. DAT High Power Searchlight AT-398 maximum 9000mA large batery and 50 hours work time LED projector, battery, model AT-398, with powerful LED 20 W with built-in camping lamp with two powerful diodes, waterproof. List Price 85.90лв. VAT Incl. 81.60лв. VAT Incl. 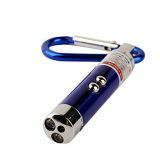 LED flashlight with a pen for tablet and keychain P3855, 4xLR41 batteries Compact LED flashlight with a pen for tablet and keychain. Solar lighting system GD-8007, 9V, 3-7W Multifunction portable solar kit with flashlight, LED lamps, headlight and USB output for charging mobile phones. Is intended for the home or garden, camping, fishing, tourism. The flashlight, also known as a projector, is a portable lighting device, primarily for outdoors use or in areas where lightning it is unavailable or can not be provided The projectors can be many different types depending on their size, type of power, application, lighting elements, etc. They are mainly divided into two types - flashlights with incandescent filament and LED flashlights. LED flashlights are far more economical, emit more light and have much longer lifespan. Many of the projectors, with high power LEDs, offer an option for adjusting the focus and centering or spreading of the beam. Extremely practical and convenient are projectors called " headlight " which can be attached to the head or to a helmet. They are very suitable for riders or for people who work in narrow and dark rooms, thereby both hands remain free. Projectors and flashlights are mainly powered by ordinary or rechargeable batteries. VIKIWAT Ltd. is a distributor of a wide range projectors from reputable suppliers and offers proven quality at competitive prices.